Copper-based paints play a key role in preventing fouling on boats, but because copper dissolves in water, the water-quality regulatory targets for copper in places like Marina del Rey Harbor, above, have been exceeded. SCCWRP and its partners are pursuing a study examining whether copper targets should be modified to more accurately reflect copper’s ecological threat. A technical advisory committee in December is scheduled to review the draft workplan for a study examining whether existing regulatory targets for dissolved copper in Marina del Rey Harbor should be modified to more accurately reflect the ecological threat posed by copper. The two-year study, led by SCCWRP, will document the concentrations of copper that aquatic organisms in the Los Angeles County boat harbor are exposed to at different times of the year, and how toxic these copper levels are at different sites across the harbor. 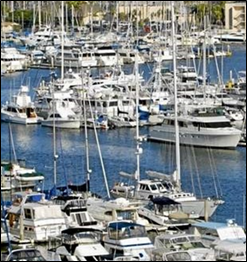 Under the harbor’s existing Total Maximum Daily Load (TMDL) regulatory target, Marina del Rey Harbor is required to reduce copper loading by 85%, which would require boat owners to make significant changes to the types of anti-fouling paint they typically use on the underside of boats. At an all-day meeting scheduled for December 17 in Marina del Rey, the three-member expert panel will provide feedback on the study design and address questions from stakeholders regarding steps to ensure that modified water-quality objectives from the study will protect aquatic life. The draft workplan was released for review in October. Field sampling for the study could begin in early 2019.